Friday December 8th 1899 It was a fine morning. I went to town with Will did some shopping and got over home for dinner had a little visit before starting home at three oclock. Lee seems better than a week ago. Saturday December 9th 1899 It was a cloudy dark day with some rain. I did some work before going down to Callies to the rag sewing. There was a very pleasant company there. I stopped at Mrs Simpsons on my way home It is a year today since Edith died. 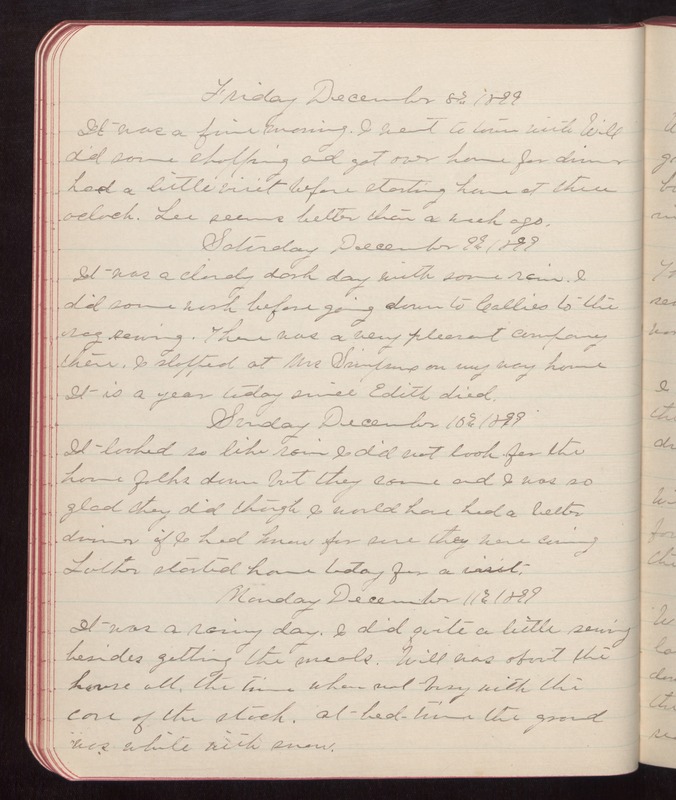 Sunday December 10th 1899 It looked so like rain I did not look for the home folks down but they came and I was so glad they did though I would have had a better dinner if I had know for sure they were coming Luther started home today for a visit. Monday December 11th 1899 It was a rainy day. I did quite a little sewing besides getting the meals. Will was about the house all the time when not busy with the care of the stock. At bed-time the ground was white with snow.